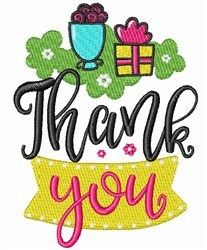 When you want to say thank you try using this pretty design! Stitch this onto a set of towels to give as a thank you gift. Easy Embroidery is happy to present Thank You! machine embroidery design which has 13331 stitches and is [75.88 mm x 101.56 mm] large. If you would like to view more embroidery patterns please search on our embroidery designs page.